The 18th Century Dutch still-life painter Jan van Huysum is best known for his astonishing attention to detail when it came to painting flowers, fruit and insects. 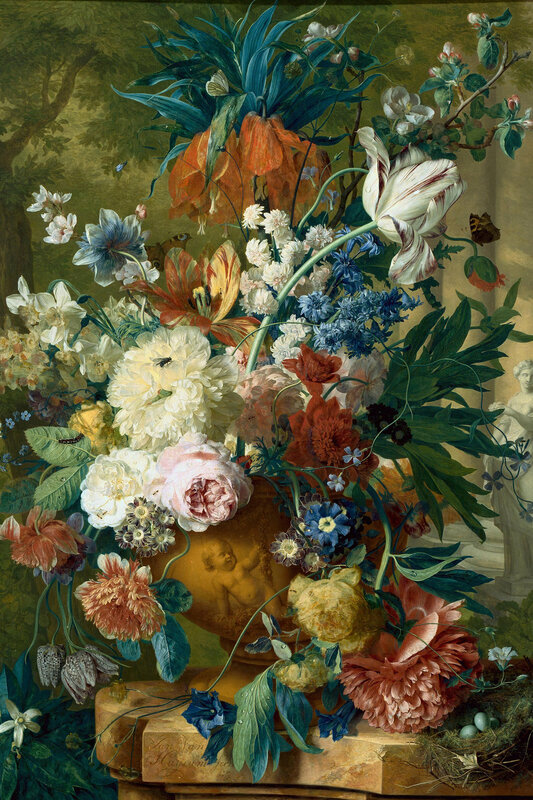 Van Huysum played a pivotal role in developing the style that we now clearly associate with classic Dutch still life. His mastery of luxurious, curved bouquets filled with abundant flowers is seeing a modern renaissance in many floristry classes and schools. Instagram is flooded with photos of gorgeous urns, overflowing with flowers and foliage, with tables draped beautifully in velvet or silk. Tiny skulls and fruit often sit perched against the vessel, mimicking the still life paintings of the great Dutch masters. What is evident in van Huysum’s work - and was the focus of one specific travelling show of his works in 2014 - was the “impossibility” of his paintings. Many of his works were painted over several years, so that he could capture the beauty of flowers that could never have been seen together in a garden. By combining flowers that bloomed during different seasons and in varying climates, van Huysym created magical, almost mystical arrangements. His paintings have been described as “illusions” because the flowers in his works could not coexist in reality. Not in the 18th Century, at least. Jan van Huysum, Flowers in a Vase with Crown Imperial and Apple Blossom at the Top and a Statue of Flora 1731-2. What’s in this bouquet? Fritillaria imperialis, Fritillaria meleagris, Tulipa spp., Narcissus spp., Paeonia spp., Rosa spp., Vinca spp., Primula spp., Malus spp., Papaver somniferum or orientale, Ipomoea purpurea. 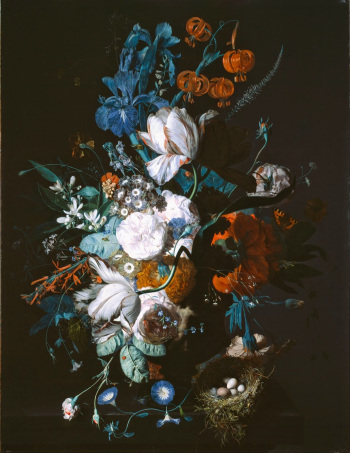 Whoa… No wonder it took van Huysum two years to paint. Now, we are able to easily combine tropical flowers with chrysanthemums; spring-blooming bulbs with late season delphiniums; and peonies with evergreen boughs harvested in late winter. Why? Because floral wholesalers are able to access blooms and foliage from all over the world and ship them right to our door. Growing seasons and local climates no longer dictate what we can put into a vase on our kitchen table or the head table arrangements at an elaborate wedding. We do not need to wait until late summer for the sunflowers or Rudbeckia to bloom - we can get them shipped to us from California or Ecuador in the bleak mid-winter. Peonies are available to the discriminating bride getting married in January in the mountains of Banff, Alberta when the outside temperature dips below -20 C.
The so-called “Impossible Bouquet” is no longer impossible. Limits of season and geography no longer exist and we are now able to create fantastical arrangements of flowers that could have never coexisted together 100 years ago. We are ultimately creating curated experiences of nature - things that look stunning on our Instagram feeds and dupe the naïve public into thinking that what we are showcasing is, in fact, natural. Instead of enjoying the spare elegance and rich beauty of winter in temperate climates, we are forcing summer to join us in the form of peonies and poppies. We import flowers from Africa and South America in the name of what? Pretty? Jan van Huysym, Vase with Flowers. Notice the nodding Lilium martagon. The real question here is - are we ok with the cost of this pretty? This is something that I will be exploring more in depth in subsequent posts: exploring what the seasonal flower movement means in terms of sustainability, environmental integrity, and human health; examining what seasonal flowers means here in Zone 3/4 Alberta; and taking an in depth look at whether the “Impossible Bouquet” should remain just that - impossible.